Norham upon Tweed is the second most northerly village in England, only Horncliffe (some 4 miles to the North East) is further North. The village lies in a valley on the south bank of the river Tweed. Norham is well protected from the weather by the Cheviot hills to the South West and the Lammermuir hills to the North and has a remarkably mild climate for somewhere so far North. The village is overlooked by the castle on a hilltop to the east. The church is on the North side of the village, and in the centre of the village is a triangular village green on which is an ancient market cross surmounted by a weather-vane in the shape of a salmon, depicting what was at one time the major source of income for many of the villagers. Most of the villages houses are built of stone (taken from the ruins of the castle in many cases), although brick built "council houses" are now to be found in two small housing estates, and new brick homes are gradually surrounding the village. River crossings have always been good places to live by - Places of excitement and opportunity - and here at Ubbanford as Norham used to be known, long before the first bridge was built, was one of the most important crossings on the Tweed. This was the place where St. Aidan crossed on his way from Iona to Lindisfarne in AD 635. For centuries thereafter the great ford at Norharn was much used by, amongst others, clerics and monks on their way from the Border Abbeys to Holy Island and it was here that they brought the body of St. Cuthbert to rest while evading the depredation of the Vikings. Partly as a result, Norham developed early as a religious centre and in AD 830 the first stone church was built where the yew trees now grow to the east of the present church. 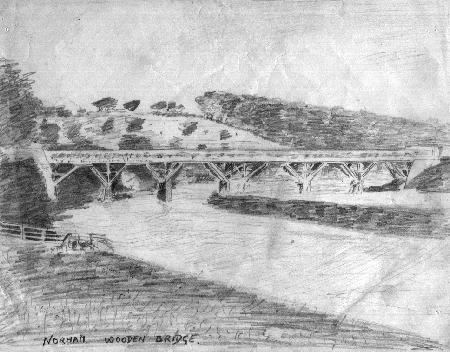 Norham wooden bridge. Pre 1864. In these early years of almost continuous strife and pillage an added attraction was the existence of a strong point on the site of the present castle to which people could retreat and defend themselves. Responsibility for the defence of the Eastern Marches had been delegated by the King to the Prince Bishops of Durham, and Norham, already a religious centre now became the administrative centre of this northern outpost of the County Palatinate because of its military strength. The building of the castle in 1121 by Bishop Flambard brought a strength and security which materially increased the number of residents and the village "assumed a consequence to which it could before lay no claim".. (Rev. James Raine's 'The History and Antiquities of North Durham' 1852). So Norham evolved over the succeeding. centuries as a place of standing and importance. The castle was the chief stronghold in North Durham of which Norhamshire was then a part, and was one of the main pillars in the defence of the eastern borders of England against. Scotland. Following the Union of England and Scotland in 1603, the castle's importance vanished and it was no longer maintained by the Crown: as a consequence Norham itself became a place of lesser importance. 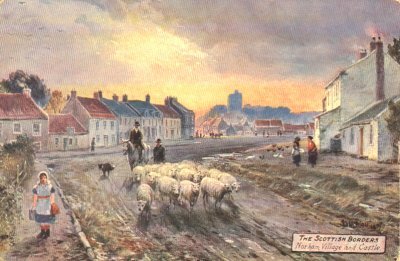 The main lines of communication between north and south were bypassing the village and becoming more firmly established to the east at Berwick and to the west at Coldstream and Norham's importance as a crossing place whether to north or south or between the east and west borders was much diminished. The village thus changed from a Border strong-point to a farming and fishing community.